He's certainly not the first writer to get his own toy but good lord, if he isn't one of the best. 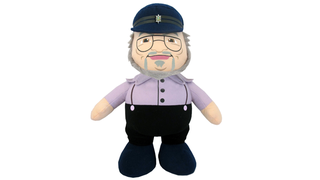 It's a huggable, loveable, favourite-GoT-character-killable George R. R. Martin doll! We want one so bad we're willing to let Winds of Winter get delayed again just to have one right now. A few weeks ago Factory Entertainment announced that they had agreed a deal to obtain the elusive George R. R. Martin license - no, not for Game of Thrones, but George himself. An untapped revenue stream for fans of Fisherman's Caps and fantasy novelists! When they announced the deal they teased a talking plush, and now pictures of it have hit the web. Look at him! D'aaaw. The 12" plush figure says 10 phrases, specially recorded for the doll by George himself. According to Nerd Approved - who nabbed the photo of the doll at Toy Fair last weekend included below - one of the phrases he says is 'When you play the Game of Thrones, you win or you die'. Which, let's be honest, is pretty damn great. I hope one of the others is "I'm going to kill of Tyrion, just to spite you all.". That, or "Hodor's takes the Iron Throne, you heard it here first!". What can we expect from Factory's George R. R. Martin next? God knows, honestly, but plush George will be available later this year. Let's hope he arrives sooner than his books do.